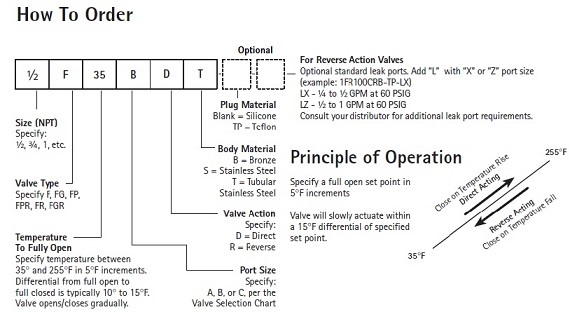 Fluid Sensing Valves On Ogontz Corp. Available in line sizes from 1/2" to 2"
The heart of the F Series valve is a unique, solid-liquid phase thermal actuator. This hydrocarbon wax-filled device actuates the valve in response to changes in temperature. The transition from solid to liquid phase causes a large change in volume, exerting a tremendous force over a narrow temperature band. Example: Model TMR100 starts to open when water temperature is 85oF [29.5oC]. Valve is fully open at 100oF [37.7oC]. As water temperature lowers, valve starts to close, and is fully closed by 85oF [29.4oC].